I feel like I am jinxing myself here, but I am going to say it anyway: I *might* make it home in the next few days. I know, exciting stuff. Last night as I was getting ready for my run, I happened to glance outside and saw a bunch of strange birds milling around. 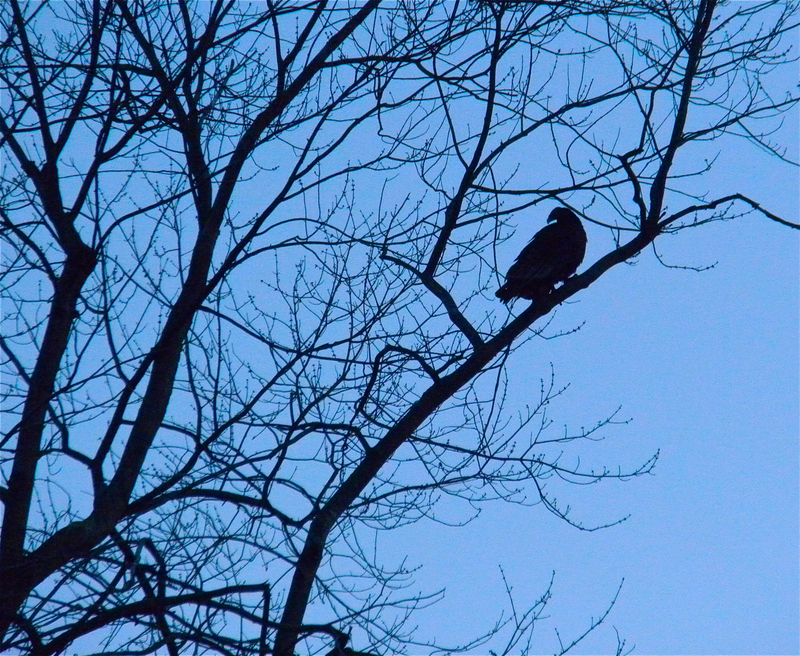 Apparently they were Turkey Vultures, which I had never seen before. I grabbed my small camera and ran outside to get some pictures before the light faded. For a bunch of vultures, these guys seemed pretty cowardly. Every time I got close they would fly into the trees. I thought they would have been a little braver than that. After my unsuccessful vulture stalking, I went for my run. It was good but not great, the hills were a little too much for me last night. Speaking of which, time to investigate how hilly the 6k course will be! This entry was posted in Uncategorized and tagged Animals, Running, Travel. Bookmark the permalink.